Interlibrary Loan is the process by which you can borrow books from other libraries through Grafton. GLDYS is the search on the main page of the library's website. If Grafton doesn't have what you need, you can use GLDYS to search for books and journal articles at other libraries and request them through Interlibrary Loan. GLDYS is the easiest way to find print or electronic books for your research. You can search GLDYS with the search box on the library's main page. This search defaults to a keyword search of resources at Grafton Library and other libraries around the word. The keyword search is the broadest search you can perform because it searches for your search terms anywhere in a book's (or item's) record (including title, author, description, table of contents, etc.). 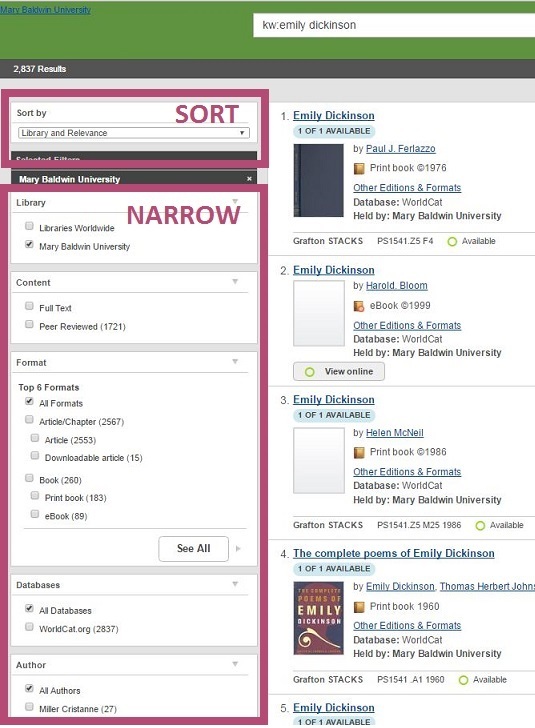 If you would prefer to only see items Grafton library owns you can limit your search to "Mary Baldwin University" under Library at the top of the right column. If you find an item owned by another library, you can request it through interlibrary loan. GLDYS has an advanced search that allows you more control over your search. To access it click on the Advanced Search button under the GLDYS search box on the main page. If you've already tried a search and are in GLDYS, you can also access the advanced search by clicking the link below the search bar at the top of the screen. Keyword - The general keyword search is the broadest search you can perform, because it searches for your search terms anywhere in a book's (or item's) catalog record (including title, author, description, table of contents, etc.). Title - searches for your search terms in the title of each record. This search brings back a list of items that have your search words in their title. Use this search if you know the exact title of the book, or even you know a few words that might be in the title. Author - searches the author field of an item's catalog record. This search brings back the actual item records for the search results (unlike Author Alphabetical, which brings back a list of author names). For example, if you search for "Jones" you'll bring back results with all items in Grafton Library that have "Jones" as author name. Subject - searches for your search terms in the Library of Congress Subject Headings of each record. This search brings back a list of items, that have Subject Headings containing your search terms. Use this search even if you don't know the exact Library of Congress Subject Heading, because you'll get results that have your search terms in their Subject Headings. Then you can use the Subject Headings' links from those results to link to related items. GLDYS' advanced search also allows you to apply limiters to your search before you see your results. When you perform a search in GLDYS, you will get a list of results. Use the left-hand side bar to narrow, limit or refine your results by format, author, year, language, topic and more. You can also sort at the top of your results list by library, relevance or date. 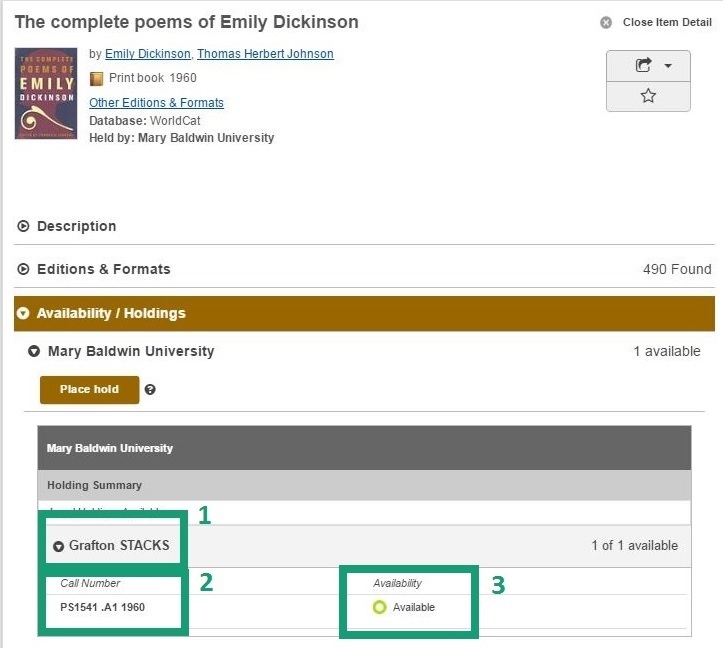 You can tell Grafton owns an item by the black "Held by: Mary Baldwin University" text located in the description of the book. Click on the title of an item to get more information. You will get a record that gives you more information about the item. Grafton STACKS: can be checked out. REFERENCE: these books cannot be checked out. They are located in a special section near the computers on the main floor of Grafton. DVD STACKS: indicates DVDs. DVDs are shelved next to the elevator on the main floor. PERIODICALS MICROFORM- located on the 1st floor of Grafton Library. Please see a librarian if you need help using the machines or locating the microfiche or microform. RESERVES MAIN DESK: please see the front desk to access this item. It will be available for checkout for a limited time period. 2. Call Number: indicates where you can find the item in Grafton Library. Read the instructions on the right side of the page to learn how to read a call number. 3. Status: indicates whether the book is checked out, checked in, or on hold. To place a hold on a book, Create a library account. The Description section of the record tells you information about the physical item and the content of the resource. Expand the section by clicking on the arrow next to the section name. You may find it helpful to look at the table of contents, when provided, as well as the subjects. If you click on one of these links it will take you to other resources with the same subject, linking you to other materials on your research topic. Grafton Library uses the Library of Congress Call Number system to organize the resources in our collection. This system uses a series of letters and numbers that indicate to researchers the subject area and location of the item. Each item in the library has a completely unique call number. The first symbol is a letter or a series of letters. The first letter tells you what section of the library to find and the second letter (and sometimes third) further narrows your search. These are organized alphabetically on the shelves. For example, if you have an item that starts with PR - you would first find the Ps and then look past PA, PB, PC, etc., until you found the PRs. The next part of the symbol will be a number. This first number is a whole number. It might be 1 or 1000. Make sure you treat it like a whole number. PR25s will come directly after PR24s and before PR26s. These numbers might also include a decimal point. Once you have found the whole number you are looking for within the right alphabetical range, you now need to narrow your search further within that whole set of numbers. PR25.52 will come after PR25.483 and before PR25.6. This first decimal point is important to note because any number you now find in the call number needs to be treated like a decimal point until you get to the publication year. The next set of symbols will again be a letter and number combination. Treat it like you did the letters and numbers above - remembering that the numbers much be treated like decimal points. Some call numbers have only two letter and number combinations while others have three or more. Take each set one at a time and you will slowly close in on the item you need. The final number is the publication year. This number is sometimes missing from earlier works but it is very helpful, especially when you are looking for a specific edition of a work that has been published multiple times. The Es are Histories of the Americas - within the Es, the E300s are American History, narrowed down to E302 which focuses on the Revolution to the Civil War, and finally E302.5-302.6 are Biographies (Late eighteen century). Once you've found the call number area for your area of research interest, make sure to look around on the shelves for other items that might be helpful and interesting. For a detailed breakdown of call number ranges - you can browse through the Library of Congress's Call Number Classification. GLDYS is probably the easiest way to search for books, but it isn't the only way. If you would prefer to search individual databases of electronic books Grafton owns, you can! EBSCO Academic eBook Collection Description of this database. Early English Books Online (EEBO) Description of this database. Search the Staunton, Waynesboro and Augusta County Public Library Catalogs. Links to members of the VIVA library consortium. Public Library for Albemarle, Greene, Louisa and Nelson counties as well as the city of Charlottesville. Open Library Description of this database.